w i n t e r 2 0 1 4 | w e s t w o r l d A l b e r t A 31 I t's just after 7 a.m. and I'm being pulled around by a baby tractor. Sitting in a three-person trailer, I loll to and fro as the pint-sized machine tows me in circles and jerkily changes direction. We narrowly miss the other 21 tractors also "tow-si-towing" to the square dance tune blasting from the overhead speakers. "Grab all yer stuff and keep the good times rollin'," drawls the voice of Mater as the ride slows to an end. Yep, the hillbilly tow truck character from the 2006 Disney-Pixar movie Cars was such a hit he's landed his own attraction – Mater's Junkyard Jamboree. And it's right at the entrance to Cars Land in Disneyland. In June 2012, the Anaheim, Calif., theme park completed a five-year expansion, including this five-hectare film- inspired section. I, husband Dan and our son omas are revved to check it out. Land within a land It's our first visit to Disneyland, though we already have three trips to Walt Disney World in Orlando, Fla., under our theme-park belt. The biggest difference? Here, we can walk to everything, from the original Disney theme park (1955) to the California Adventure Park and the Downtown Disney shopping district (both added in 2001) that runs between them. A few days here and the place feels familiar, like visiting a small town where we know where we're going and can easily come back to what we passed by the day before. In contrast, about five Disneylands could fit inside the sprawling 10,000-hectare Orlando resort, where we boarded shuttles to the various parks and lands – more choices but with a city-like sense of place. Just saying, it sure was convenient this morning to slip through the turnstiles near our hotel and hoof it on over to Cars Land in less than 15 minutes. Cars brought to life To anyone familiar with the movie, it's like Radiator Springs has leapt off the animator's palette and sprung to life. 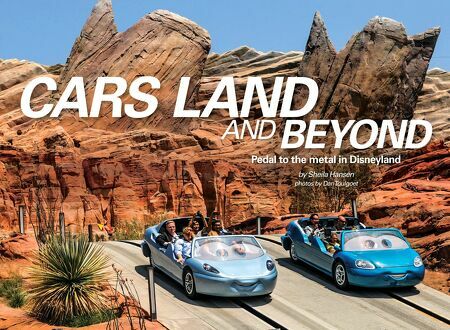 (The plot follows hotshot race car Lightning McQueen, who accidentally winds up in a scrubby little disney AMA SAyS: "Bring your own bottled water to save on drink costs. Freeze a couple of the bottles overnight – the frozen ones will keep the others cold as they unthaw, and then you can drink them, too." 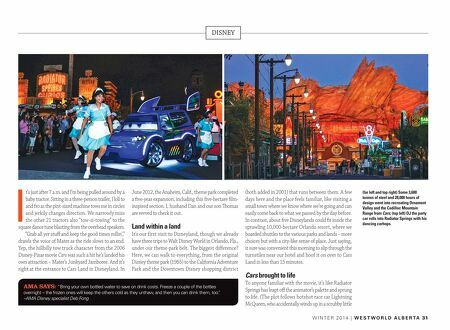 –AMA Disney specialist Deb Fong (far left and top right) Some 3,600 tonnes of steel and 28,000 hours of design went into recreating Ornament Valley and the Cadillac Mountain Range from Cars; (top left) DJ the party car rolls into Radiator Springs with his dancing carhops.